Well, these just might be the tastiest, easiest scones ever. My friend Ren (who is currently in Thailand, adventuring and taking so many amazing photos) gushed about the wonder that is the Zuni Cafe scone. Judy Rodgers’ San Francisco restaurant is known for many things, but their early morning orange-currant scones have become a fixture. A treat that I cannot wait to try firsthand when I move to the Bay Area for the winter. Oh, did I mention that? Ah! I’m skipping town after Christmas to do an internship in the cafe’s kitchen at Chez Panisse for a couple months! Really, really beyond words. 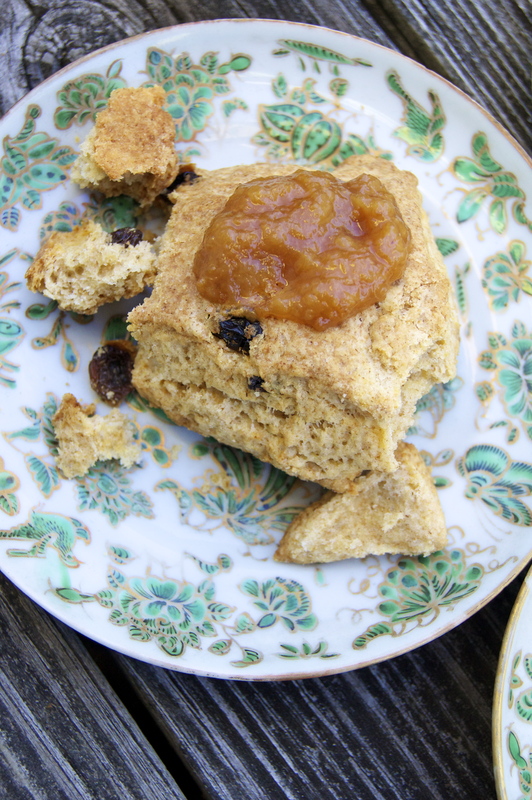 These super simple scones can be adapted for so many different flavor profiles. Feel free to use the dough as a base, and add in anything you have on hand that may be yummy. I credit the amazing deliciousness to a perfectly crafted recipe; Zuni Cafe has been making these scones for years, and therefore they’ve totally perfected the recipe. So many good recipes in Judy Rodgers’ monumental cookbook. If you can, it also makes a world of difference to use good quality butter and milk. I excitedly snatched up some bright, bright yellow butter and rich, cream-top milk from Appleton Farms, a tasty treat from their grass-fed cows. Definitely kicked it up a notch. If you’d like, you could also throw in a little spice in there as well. I added a couple pinches of ground ginger! Preheat the oven to 350, and line two baking sheets with parchment paper. In a large bowl, combine and mix well the flour, sugar, baking powder, and salt. Cut in the cold butter until it’s the size of small peas. Add the fruit and/or nuts of your choice, and the orange zest, mixing until all incorporated. Feel free to just get your hands in there – I think it’s more fun that way! Whisk the milk and egg together, then add to the dry ingredients. Fold it in until the flour absorbs all the liquid and you can form a ball of dough, but no need to overwork it. Divide the dough in half and form two balls. Lightly flour the counter and pat each dough ball into a 6- or 7-inch circle, then roll it out until just an inch thick. Cut it into 6 pieces, just like a pie – and oh my goodness, you’re getting so close to sconey deliciousness now! I can almost smell it. Gently plop onto the baking sheets and pop into the oven. Bake until so fragrant and golden brown on top, and firm to the touch. So, so yummy straight out of the oven. I served mine with peach-saffron jam, but they also shine without any accompaniments. I only had 2 cups of all-purpose flour, so I added in a cup of whole wheat flour. It gave it a nice hint of nuttiness. The original recipe does 1/2 cup dried currants and 1 tablespoon orange zest.